Where is 4YFN held and how do i get there? Who is the audience for the 4YFN event? Can I access MWC with a 4YFN badge? Can I collect a 4YFN badge from a MWC collection point? Can I cancel an invitation? How can I change the Registration Coordinator? How can I contact Official Suppliers & recommended Service Providers? How can I contract Security staff? Which passes have extended hour access? How can I view stand plans? When must build up be finished? I would like to become a new exhibitor, what should I do? Where can I find the list with exhibition official suppliers for MWC? What is the Exhibitor & Partner Registration System? Why should I become a MWC sponsor? Do exhibitors have access during build up and dismantling? Are there any invitations or discount codes available? Can a fake email address be used for attendee registration? Can I downgrade my pass? Can I link my registration account to my Linkedin Account? Can I pay by wire / bank transfer? How can I add an alternative email address to my registration? How can I claim VAT back? Why am I not receiving communications? When will receive the badge collection QR Code? What is the cancellation or substitution policy? How can I register myself to the MWC public registration? I am working on a stand, do I need to register? I do not have a LinkedIn account, can I still register? I have problems with my registration code what can I do? I don't have an email account to register. what should I do? MWC19 - What are the prices for the passes? What does my pass type give me access to? How do I register my LinkedIn? I do not remember my LinkedIn password. What should I do? I have problems during my registration, what can I do? Can I register for a Partner Programme onsite? Can I have seminars information? Do I need an additional badge to attend a Partner Programme? Will I receive a Partner Programme confirmation? How do I attend a Partner Programme? How many Partner Programmes can I attend? Where can I find the agenda for the Seminars, Conferences, and Partner Programmes? Can I register myself at the airport? Can I make cash payment onsite? How can I collect my printed badge? Where are the Registration Areas? Does the Digital ID replace the printed badge? How do I log into the Digital ID? Can I reach Gran Via by taxi? Can I take the metro to / from airport? Can I use my transport pass on L9 or L10? Am I required to book my hotel stay through your official accommodation agency? How can I collect my transportation ticket? How frequent are trains on the Metro? Should I wait to book hotel and airline reservations in case prices comes down? Where can I get a list of available hotels? What are Metro hours of service? How can I avoid hotel fraud? Are there two Line 9's? Can I download an exhibitor list? Can I have a media list? How can I get my certificate of attendance? When will I receive the GSMA Intelligece report? What are the Ministerial Programme attendance criteria? How can I stop receiving GSMA notifications? How can I submit an Awards entry? How can you ensure the security of my personal data? How do I attend the Global Mobile Awards Ceremony? MWC19 - What are the event dates and location? What are the event hours or opening times? Where can I find rules and regulations for MWC? MWC19 - Where can I find 2018 Event Highlights? Is there a minimum age or options for children to attend MWC? How are you collecting ID information? Will I still be allowed entry to MWC if I do not provide my ID information? Why are you collecting attendee ID? How can my registered attendees submit their Passport / EU National ID card data? Is ID collection something new? What forms of ID will be accepted onsite for badge collection? What forms of ID may be used to register? Is the GSMA again collecting attendee ID as part of the registration process? Have you received credible security threats against the event? How will security forces act upon information they find through this process? Do you require this of all attendees to Mobile World Congress? What if I don't want to provide my ID information to be collected? Will I still be allowed entry to Mobile World Congress? Is the GSMA working with external organisations on this process? How is the information sent to the security forces? Is this a secure process? How long will you retain this information? Is this something that Barcelona/Catalunya is undertaking with all events hosted in the city? What if I don't meet the press / analyst criteria? How do I apply as Press / Analyst? What does Press / Analyst Pass include? Can I pay to get a speaking slot at MWC19? How can I register myself as a speaker? I submitted a proposal in the call for papers process. When will I be notified if I was chosen to speak? I'm interested in becoming a Speaker at MWC2019, how can I submit my Speaking proposal? Which are my App login details? Why can't I access the App If I'm registed? How can I get an original visa letter? How can I modify data from my Visa letter? How can download my visa invitation letter? How do I register for a Topic Tour? Are the Topic Tours included in my MWC19 pass? Are the Topic Tours refundable if I can’t make it onsite? Why don’t I see any tours when I try to indicate my interest? How many tours can I attend? Can I register for a Topic Tour onsite? Can I use the Member discount code? GSMA Members benefit from a 30% discount on passes to MWC. If you are from a member company and wish to use your 30% discount code, please follow the steps below to retrieve your code. Please Note: The discount code is only for use by attendees from a Member Organisation. Discount codes are not to be shared with external customers and clients. If you use a Member discount code and are not an eligible attendee from a Member Organisation, you will be personally liable for the full amount of the applicable registration fee. Log into InfoCentre2 and click on My Organisation. Locate your Organisation ID under Organisation Name and Company Introduction. This will be up to 5 digits long. If your Organisation ID is less than 5 digits, please insert zeros into the blank spaces to create a 5 digit code e.g. MWCB00123. During registration, click “Apply Code” enter your code to receive the discount. If you have any queries regarding your eligibility, contact the GSMA Membership Team. We do not provide discount codes or invitations. Invitations for MWC are exclusively sent from Exhibitors directly to their staff and guests. Only attendees from a GSMA member organisation are eligible to receive a 30% discount on any pass purchase. If your company would like to maximize the potential of your business with GSMA Membership, please visit the GSMA website or contact [email protected] and ask for the benefits of becoming a GSMA Member. Please use a valid email address to register for MWC. Your email address is what we use to create your account and we send username and log in details to this account as well as password recovery emails and other important registration information. If you are concerned about receiving information that you do not require, please access the Email Preference Centre to change your opt-ins. Only the Silver, Gold and Platinum Invitations can be cancelled. Please note that the EVP, Staff and Contractor passes have a multiple code that cannot be eliminated. Please note that invitations that haven't been used to register will not be deduced from your passes allocation. ALL SALES ARE FINAL. Cancellations, as well as ‘no shows’ will be liable for the full registration fee. Cancellation of travel and hotel reservations are the responsibility of the registrant. Downgrades of passes are permitted but will still be liable for the FULL registration fee of the original pass purchased. You can find it in our cancellation policy, which you accepted in My Registration when you registered. If you are registering for the first time, you can click on the Sign In with LinkedIn button when you begin your registration process, here. PLEASE NOTE: If you have been forwarded an invite with a code to register, please ensure that you use the same email address that the invite was sent to. If you already have a MWC registration account, you will be able to link to your LinkedIn account during the registration process. Yes. However, it is best to apply in advance to your interested programmes. Many partners require pre-registration, and programmes may reach capacity prior to the start of MWC 2019. Registrations are individual. In case you want to register more than one person, you will need to create a new registration account using a different email address for each attendee. Yes, Airport Registration and Badge Collection will again be open at Barcelona Airport T1, T2B and T2C for MWC19. Yes, onsite registration is possible, however, we recommend completing your registration before arriving onsite as onsite registration can take a long time to complete. All registered E&P Registration System passes can be cancelled at any time even if they have received their registration code and barcode. However, once a registered attendee modifies their registration account Exhibitor Coordinators will no longer be able to cancel that pass. The E&P Registration System will show you the message: "You cannot cancel this registration as it was already modified by the attendee." In the “Pass & Attendee Management” tab click on "Search for Invitations" to search for the attendee you want to cancel. Enter the ‘Primary email address’ and click on ‘Search’. In the ‘Actions’ column you will find an icon to "Cancel Registration". Please click there and ‘Proceed’. As a 4YFN attendee, you may only attend MWC on Thursday 28 February. Please refer to 4YFN FAQs for badge collection information. You must collect your badge from the 4YFN Registration area located at Hall M8, Fira Montjuïc (Avda. Reina Maria Cristina, s/n, Barcelona). You must collect your badge from the 4YFN Registration area located at Hall M8, Fira Montjuïc (Avda. Reina Maria Cristina, s/n, Barcelona). Please refer to 4YFN Registration for badge collection information. Yes, certainly. Also note that two taxi ranks are available at Fira Gran Via, located at the North and South Entrances. Taxis are available over the weekend prior to the event and will be fully staffed during event days. Can I take the metro to/from the airport? Yes! L9 Sud connects Barcelona Airport to the city, with a stop directly underneath Fira Gran Via. Trains depart the airport every 7 minutes during peak times, and the journey to Fira Gran Via takes less than 25 minutes from the airport. Also the new metro line L10 Sud has a stop, Foc, next to the venue, Hall 8.0. 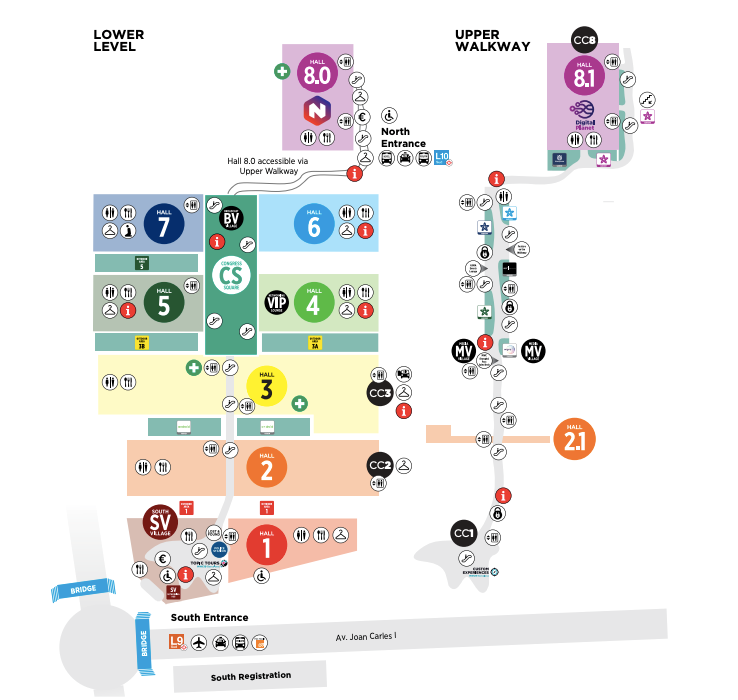 T2 Terminal: From Baggage Claim, follow the signs to MWC Badge Collection; the T2 station is located a few minutes’ walk from Badge Collection and is clearly signposted. While you’re at Badge Collection, don’t forget to pick up your Free Transport Pass, which can be used on event days. Your free transport pass even covers the supplemental costs between the Airport and the city. Absolutely. The Free Transport pass is good for all Metro and FGC trains on event days. Your free transport pass even covers the supplemental costs between the Airport and the city. Remember: the free transport pass is valid during event days only, so if you’re using public transport over the weekend, you’ll need to purchase tickets for those days. Of course - you're able to book rooms through any service or provider you prefer. However, you do so at your own risk, and we cannot guarantee the quality of service. By using the official accommodation agency, you are assured of working with a reputable company and will have local assistance should you experience any difficulties or problems during your stay. Unfortunately, several MWC exhibitors and attendees each year fall prey to accommodation offers from fraudulent companies. These hotel providers present themselves as official event partners but are not legitimate. Please visit the hotel section in this manual to know more about hotel fraud. Because of the number of rooms b network secures for MWC attendees, they're able to secure great discounts not available anywhere else. In fact, they've managed to negotiate discounted rates at many great properties around town. These discounted rates are only available through b network and are another reason to book your accommodation through the official provider. Please note: past attendees have received e-mail offers for hotel rooms from non-official agencies and then found themselves without accommodation upon arrival. If you choose to respond to such offers, please exercise caution and carefully read the cancellation policy, if any. The GSMA is unable to provide you with any assistance if you do not book through b network. The exhibitor list a is already available in our website and in our official app. Please note that we cannot provide any other document. The press list will not be published or provided to attendees before or after the event. GSMA Seminars are open to all MWC attendees and will cover several topics in the 2019 MWC edition. Please visit our website closer to the event to have more information. Can I make a cash payment onsite? No, cash payments are not accepted onsite at MWC 2019. It is possible to pay by bank / wire transfer. This option will be available to you in Step 3 of the registration process where you will be able to choose your method of payment. Please ensure that you leave enough time for this payment to be completed as processing can take up to 10 days. Badges cannot be issued without payment being made in full. Note: The final date for making a wire transfer payment is 14 February 2019 in order to allow time for the payment to clear. If you still wish to register after this time, you would be required to use a credit card. No. Speakers are selected on the topic relevance and originality of their submission, in addition to their proven ability in the proposed topic and overall prominence in the industry. There is no link to sponsorship or commercial spend at the event. No, you will use your existing MWC badge to attend the programme. Your badge will be scanned at the theatre door for entry into the programme. Click here for more information on badge collection. An invitation is not required to attend, as you are able to purchase a pass through our website. Some attendees do however receive an invitation from an exhibitor / partner with an registration code to register for a complimentary pass. Please refer to this email before starting the registration process. Please also ensure that you use the same email address that the invite was sent to. Please read the information here to understand whether you need a Visa to enter Spain. If you do not require a visa, you should not apply for visa support as the GSMA will not issue supporting information for nationalities that do not require a visa. No, the Digital ID does not replace the Printed Badge. You must wear your printed badge onsite at all times. Speakers are selected on the topic relevance and originality of their submission, in addition to their proven ability in the proposed topic and overall prominence in the industry. We collect this data via two methods – manual input by the attendee into the registration website or via a scan of their MRZ (Machine-Readable Zone) code on their passport or their EU National ID Card. In either case, the data is encrypted and securely transferred to a server and will only be retained for the period leading up to, onsite and shortly after Mobile World Congress. Attendees are required to provide this information as part of the registration process prior to arriving at Mobile World Congress; for those registering onsite, it is mandatory that they provide this in person in order to complete the registration process and collect their printed badge. During the registration process you will be able to add an alternative email address. If you add in an additional email address, a copy of all registration communications will be sent to this address. You should note that we WILL NOT send any communications relating to password reset to the additional email, this will only be sent to the primary email address. Kindly send an email to [email protected] specifying precisely what details would you like to change and how would you like them to appear on the invoice. Once received, we will proceed with the modification as soon as possible. In case you need to change the Registration Coordinator, please click here and log into the Online Event Manual click on ‘Company Details’ and click on “Additional Contacts and Registration Coordinator”. Look under the “Registration Coordinator” and click “edit”. The GSMA does not promote a tax compliance and recovery service for MWC. This is due to differing standards of service and delivery available to different attendees and exhibitors in different countries. You may wish to undertake a search in your country for a reputable service provider and/or engage with your accounts or auditors for a recommendation specific to your organisation and country. All attendees must collect their Printed Badge in person. Collecting badges on behalf of a colleague / acquaintance is not permitted. Instructions on how to collect your badge will be provided in your Badge Collection QR Code email. Once you arrive in Barcelona, be sure to bring the required form of ID with you to badge collection for a quick and easy process. Your PASSPORT or EU NATIONAL ID CARD must be presented in order to collect your event badge. Photos / photocopies of documents / driving licences or other forms of ID will NOT be accepted. Without this document, we are not permitted to issue your badge for the event. For Badge Collection locations and opening times click here. One Free Public Transport Pass is provided per attendee. In the event of loss or damage, replacements will not be provided. Satellite Registration locations: Sants Estacio train station, Passeig de Gracia, Accio at Jardinets de Gracia. For any questions regarding the Free Transport Pass, please visit the onsite Transport Information Point desk in the South Entrance at Fira Gran Via. The desk will be staffed 09:00 to 20:00 – Monday to Wednesday and 09:00 to 16:00 – Thursday. You can hire all Temporary Staff through ServiFira online ordering website . Deadline for ordering is Friday 11 January 2019. PLEASE NOTE: All Temporary Staff, including Stand Security Guards must hold a valid MWC badge. Temporary Staff hired from ServiFira will go directly to the stand on the contracted day. You do not need to provide them with badge, they will get it from ServiFira directly. The MWC Certificate of Attendance can be requested once you have visited the event. The request must be sent to [email protected] after the 1st of March and attendees must provide name, last name, email used to register and registration ID. The certificate will be sent by email in a pdf format. Attendees who refuse to provide their identification will not be able to collect their badge and will not be able to enter MWC. * Please note you will be required to show original ID (passport or European Union identity card) at Badge Collection. Drivers licence will NOT be accepted as proof of ID at Badge Collection. My MWC – the GSMA Official Event App username and password are the same than your My Registration account ones. Download the free My MWC – the Official GSMA Event App now, and you’ll automatically get the update when 2019 MWC app launches! Which passes have extended hours access? The following pass types have Extended Hours access into the Gran Via venue during MWC. *E&P Exhibition Visitor: Guest/Visitor pass to Exhibition only (to include anyone presenting at a session), does NOT include Extended Hours access. We are committed to ensuring the safety of Mobile World Congress attendees, both onsite at the Fira Gran Via and Fira Montjuïc venues and offsite as they visit the city of Barcelona. As part of our overall venue and citywide security plan, we work with the Mossos d´Esquadra to identify and address possible security threats. Collecting attendee identification is one means to enhance our overall security plan and improve attendee security. There are many factors why emails may not be received and is probably down to the individual’s mail server settings or the route spam filtering used by your company. Please check your spam folder and contact the IT department of your company to ask them to whitelist our email Registration from the route spam filtering company they use, and check the level settings within the mailserver. In all these cases the IT department should have the capability to trace the sender’s email that hit the server even if it doesn't arrive at the recipient’s mailbox. When will I receive the badge collection QR code? Attendees who have completed and paid in full for their registration and submitted their ID details, will receive an e-mail with their Badge Collection QR Code. You can also access your Badge Collection QR code by downloading the My MWC event app.. The Badge Collection QR Code is required to collect your printed badge for access into MWC. * Please note access to Partner Programmes at Mobile World will be confirmed directly by the event organiser. The Badge Collection QR Code received from the GSMA includes confirmation of your MWC registration only, and does not imply confirmation of attendance at a specific programme you may have applied for. When will I receive the GSMA intelligence report? GSMA Intelligence Report is sent to all Gold and Platinum pass holders a few weeks after the event via email. If you have not receive the report please check your spam folder. If you can't find it please let us know and we will send it back to you. Cancellation of travel and hotel reservations are the responsibility of the registrant. Paid attendees can send a substitution if they are no longer able to attend. Please contact our Registration team for more details on substitutions. If you received a complimentary pass or purchased a pass from an Exhibitor or Partner, cancellation or substation may be at their discretion. Contact the Exhibitor or Partner for more information. Payments will be accepted in Euros only. What if I don't meet the press / analyst accreditation criteria? If you do not meet the criteria for the Press / Analyst Accreditation and still wish to attend the event you must purchase a pass. Information on pass types and prices is available in our website. If you have any questions regarding GSMA Press application criteria please contact our MWC Press Team. The Digital ID feature in My MWC Event app allows you to access the venue without repeatedly having to show your passport or EU National ID card. However, please note that you can be asked to show photo ID at any time in the venue. If your photo was validated at MWC18 and you have not changed or amended your photo record, your photo is still validated. You must still collect your printed badge at one of the badge collection locations available. Remember that passport or EU National ID card will be required for Badge Collection. Photos / photocopies of documents / driving licences or other forms of ID will NOT be accepted. Without this document, we are not permitted to issue your badge for the event. The Ministerial Programme is an invitation only event targeted at senior government and industry representatives. C-level and senior regulatory representatives from the mobile industry, including network operators and vendors. Invitations to governments are sent in October and to industry in December. If you have been invited to attend the 2019 Ministerial Programme, please RSVP by 16 November to allow enough time to arrange your delegation’s logistical requirements. All information about the event can be found on the Ministerial Programme website. We accept payment by American Express, MasterCard, or Visa. Note Visa debit cards may not be accepted outside of the country of origin and/or your bank may decline large transaction amounts. For more information, contact your bank directly before attempting payment. Conference and keynote speakers will be contacted directly by the speaker management team with instructions on how to register. If you are speaking at an event or programme other than the official Conference programme, please contact the organiser for that event for instructions on how to register. You can register for MWC Barcelona 2019 here. Please visit https://www.mwcbarcelona.com/conference-programmes/global-mobile-awards/ for more details. Attendees are required to submit their Passport / EU National ID card during their registration process. We utilise industry-recognised encryption within the systems that collect personal data. Additionally, the GSMA and Fira have commissioned a third-party penetration test and systems audit to ensure the security of personal information. To apply as Press / Analyst please visit the press website here. You can show your interest to attend the partner programmes here. A number of awards are presented on the show floor at MWC Barcelona, across the week of the event. These presentations will be open to all MWC attendees to attend. A specific awards ceremony for specific categories will be open to Platinum, Gold and Silver Pass Holders as well as all nominees with Exhibition Visitor Passes. Further details and information on pass types will be available nearer the time. During peak hours the frequency is every three minutes, you can find more information here. You can attend as many as you want, be aware that most of them require pre-approval and some are by invitation only. Yes, all MWC attendees have to register for the event. I do not have a LinkedIn account. Can I still register? You do not need a LinkedIn account to register. I have problems with my registration code, what can I do? Successful applicants will be contacted in the coming weeks and all notifications will be sent by 30 November, 2018. If you would like to become a GSMA Member please contact GSMA Membership Team. No, there is no deadline, however we recommend all attendees to register before they arrive onsite. Exhibitor build up must finish on Sunday 24 February at 21:00. Please visit the Online Event Manual for more information. I don’t have an email account to register. What should I do? All attendees are required to provide an e-mail address to complete their registration. Please create an email account then you will be able to register. Your email address is what we use to create your account and we send username and log in details to this account as well as password recovery emails and other important registration information. Mobile World Congress attendees have always been required to present photo identification to verify their identity when they pick up their badge onsite and each time they enter the venue using their printed badge. In 2016, we began recording this information and sharing with the Mossos d´Esquadra to strengthen our overall city and venue security plan. For 2019, attendees are required to provide their passport or EU National ID card details as part of the registration process; they cannot complete their registration without it. Further, attendees must present their passport or EU National ID cards when collecting their badge onsite and those using a physical badge will also need to present passport or EU National ID cards upon entering the event at access. Photocopies of ID, driving licenses or any other forms of identification will not be accepted. MWC Barcelona 2019 will take place Monday, 25 February through Thursday, 28 February 2019, in Barcelona, Spain. The event takes place at Fira Gran Via conference facility in Barcelona, Spain. Additional activities will take place at Fira Montjuïc, located 2 kms away. Access the address and more information . Please visit the registration web for full details on prices and pass types. Should I wait to book hotel and airline reservations in case prices come down? We recommend booking hotel and flights sooner rather than later. With airlines, you’ll find the best flight options and more seat availability the earlier you book. With hotel rooms, the sooner you book the better the location you’ll secure. We strongly recommend you book your travel using our official travel partner, b network. Not only are they very familiar with our event, they’re trusted partners who will ensure a seamless, guaranteed experience. Not yet sure of your exact plans or when to arrive? Most attendees arrive into Barcelona the weekend before the show, in order to pick up their badge and familiarise themselves with the venue and transport routes before the event begins. MWC events officially begin Monday morning, 25 February 2019. Please visit the registration web for full details on opening hours. I'm interested in becoming a Speaker at MWC 2019, how can I submit my Speaking proposal? The call for speakers has now closed. We will contact successful applicants in the coming weeks and all notifications will be sent by 30 November, 2018. Nearly every language is spoken at the event, we have attendees from more than 200 countries. However, all event communications and signage are in English. Only Passport or EU National ID card will be accepted onsite for badge collection and venue access. Photos / photocopies of documents / driving licences or other forms of ID will NOT be accepted. Without this document, we are not permitted to issue your badge for the event. Please visit the registration web for full details on pass types and prices. Only Passport or EU National ID card are accepted to complete your registration. Please ensure you bring your PASSPORT or EU NATIONAL ID card with you as it will be required for Badge Collection. Photos / photocopies of documents / driving licences or other forms of ID will NOT be accepted. Without this document, we are not permitted to issue your badge for the event. In 2019, our extensive programme of activities broadens the traditional policy and regulation discussion, with a new focus on mobile and the emerging digital citizen. Please visit Ministerial Programme 2019 for more information. Please find the rules and regulations for MWC19 here. Where can I find the agenda for the Seminars, Conferences and Partner Programmes? Please visit the MWC19 agenda here. Visit the Exhibitor Resources for a full list of the official suppliers for MWC. Please visit the Hotel website here. We strongly recommend you book your travel using our official travel partner, b network. Not only are they very familiar with our event, they’re trusted partners who will ensure a seamless, guaranteed experience. You can get there by Bus Line H12 will take you from central Barcelona to 4YFN. For more bus options click here. By Metro The closest metro stop to the 4YFN venue is Plaça Espanya, L1 line (red) and L3 line (green). AeroBus running from T1 and T2 to plaza Espana every 5 min. Click here for more information. I applied for Press / Industry Analyst Accreditation and am still waiting to hear if it has been accepted. The Press Team is reviewing your accreditation request and they will respond to you shortly to advise if you have been approved. Please be aware that this process can take up to a week to be completed. If you feel that your application has been declined in error please contact a member of the GSMA Press Team at [email protected]. Registration for MWC19 Barcelona opens soon. Sign up to receive notifications when registration opens and other exciting event details. Women4Tech offers MWC Barcelona attendees strategic sessions focused on championing diversity in the mobile and tech industry. Whether you are a female or male executive, from a company of five or a Fortune 500, Women4Tech sessions will help you transform your business and show you how to empower and support women in the industry, leading the way to a more gender diverse ecosystem. For more information, visit Women4Tech Programme. The E&P System is the platform used by Exhibitors and Partners to manage their invitations. Please click here for full information on all the pass types features. What does the Press / Analyst Pass include? The Press / Analyst pass includes many features please visit the Press website for full details. What are the Metro hours of service? Barcelona Metro opens from Monday to Thursday 5:00 – 24:00, Fridays 5:00 – 02:00, Saturday 5:00 open all night, Sunday until 24:00. MWC Barcelona offers a host of areas for you to create a meaningful sponsor package to help you achieve your goals and reach your target. Contact us to discuss any of the opportunities below and learn about other options for sponsoring at MWC Barcelona 2019. For more information, visit Sponsorship Opportunities. We trust b network and only b network with our attendees’ accommodations. Don’t be taken in by fraudulent companies. Click here to learn how to avoid hotel fraud. Are there two Line 9s? No, there is only one Line 9 Sud that connects Barcelona Airport to the city, with a stop directly underneath Fira Gran Via. Trains depart the airport every 7 minutes during peak times, and the journey to Fira Gran Via takes less than 25 minutes from the airport. Also this year there is a new metro Line 10 Sud that has a stop, Foc, next to the venue, Hall 8.0. To log into the Digital ID you have to use the same e-mail address and password you used to register for MWC19. How do I register using LinkedIn? To Register with LinkedIn select the option “Sign in with LinkedIn” on step one of the registration process. Sign in with you LinkedIn login details and follow the steps. If you require an invitation letter to enter Spain, you’ll have the option to request one on “My Registration Account” once your registration is completed and payment received in full. How do I upload my photo for my Digital ID? You can upload your photo during the registration process or via the My MWC Event App. How do I validate my photo for my Digital ID? Your photo will be validated during badge collection, if you upload the photo after you collected your badge you can visit an activation desk and your photo will be validated. Please ensure you bring your PASSPORT or EU NATIONAL ID card with you as it will be required to validate your photo. Photos / photocopies of documents / driving licences or other forms of ID will NOT be accepted. Without this document, we are not permitted to validate your photo or issue your badge for the event. If you do not remember your LinkedIn password, select the “Forgot password” option from Linkedin and follow the steps. You can find the 2018 Event Highlights here. If you want to attend Women4Tech sessions, you can show your interest to attend here. Why can't I access the App if I'm registered? The minimum age to attend MWC is 16 years of age. Yes. As part of coordinated security efforts around Mobile World Congress, the Catalan police (Mossos d´Esquadra) have requested the collection of personal identification details from Mobile World Congress attendees to strengthen our overall venue and citywide security plan. Data will be collected, temporarily stored and shared with the Mossos d´Esquadra for use around Mobile World Congress only. For 2019, attendees are required to provide their passport or EU National ID card details as part of the registration process; they cannot complete their registration without it. Further, attendees must present their passport or EU National ID cards when collecting their badge onsite and upon entering the event at access. Photocopies of ID, driving licenses or any other forms of identification will not be accepted. No, but we are committed to ensuring the safety of Mobile World Congress attendees. As part of our overall venue and citywide security plan, we work with the Mossos d´Esquadra to identify and address possible security threats. Collecting attendee identification is one means to enhance our overall security plan and improve attendee security. As part of our overall venue and citywide security plan, we work with the Mossos d´Esquadra to identify and address possible security threats. Collecting attendee identification is one means to enhance our overall security plan and improve attendee security. However, we do not have visibility into the specific actions that the Mossos d´Esquadra may take. Yes, all attendees are required to provide their passport or EU National ID card details as part of the registration process; they cannot complete their registration without it. Further, attendees must present their passport or EU National ID cards when collecting their badge onsite and those using a physical badge will also need to present passport or EU National ID cards upon entering the event at access. Photocopies of ID, driving licenses or any other forms of identification will not be accepted. For 2019, attendees are required to provide their passport or EU National ID card details as part of the registration process; they cannot complete their registration without it. Further, attendees must present their passport or EU National ID cards when collecting their badge onsite and upon entering the event at access. Photocopies of ID, driving licenses or any other forms of identification will not be accepted. Attendees who refuse to provide their identification will not be able to collect their badge and will not be able to enter Mobile World Congress. Yes, the data is collected by our approved registration vendor and the collection criteria is coordinated by the local law enforcement authorities. The process is fully secured and data transmitted to the security services is always encrypted. Only selected staff in the GSMA, our registration vendor and the Mossos d´Esquadra will have access. We do not have insight into the security planning of other events held in Barcelona so cannot comment on this. Will you extend this process to other GSMA events? The GSMA will always put the security of its attendees, partners and staff at the forefront of its security planning, and decisions will be made on a case-by-case basis, subject to location, crime and terror threats in the region, among other factors. At what time can I access the venue with a contractor pass? Exhibitors and Visitors have different entry times for the event. All the Exhibitor passes (except E&P Exhibition Visitor pass) can access during Saturday 23 and Sunday 24 February and outside of the general opening hours. Can I use the Digital ID during build-up and dismantling periods? No. The Digital ID is functional during show days only. Do I need a wristband during build up and dismantling? If any of your information has changed, you can log back into your registration account and select ‘Update My Personal Information’. If you make any changes to your registration, please ensure you click the “Submit” button at the bottom of the page; otherwise your data will not be saved. Please note however that you are unable to change your Last Name and Email Address. Please login into your Registration Account by selecting the “Already Registered?” button. Select “Continue my Registration” at the bottom of the page select “Choose another payment method”, select the method fill in the requested details and click on “Submit Payment” You can always change from credit card to wire transfer and vice-versa. How can I download my visa invitation letter? A copy of your visa invitation letter will be sent to your preferred email account after your registration is fully completed and outstanding payment is settled. After logging in to “My Registration Home” page you will find the “Apply for a Visa Letter” option tab. Fill in all the mandatory fields and click on “Submit”. Full details on Standard and Extended Hours access timetables are available in the Online Event Manual. Please note that E&P Exhibition Visitor does NOT include Extended Hours access. Once your registration is complete and full registration payment has been received, you will be able to Once your registration is complete and full registration payment has been received, you will be able to apply for your Visa letter. We will process your request and a PDF copy of your letter will be send to you via email. In case you want to apply for the visa before, please kindly contact the Spanish Embassy in your country. If you have forgotten your password, you can reset it by visiting the registration website, , then click on “Already Registered?” and “Forgot Password” link and entering the email address you used to register. Topic Tours are guided and led by an industry expert through the mobile ecosystem while you visit exhibitors that will educate you on the topic of your choice, provide insights, and inspire your thinking. Topic Tours are an opportunity to meet attendees with similar specific topic interests and network with like-minded tour participants. Click here and complete registration for MWC19, or click ‘Already Registered’ to sign in to your existing account. The cost for each Topic Tour is €75. Once you pay for your tour your spot is guaranteed. You must first complete MWC19 registration to be able to purchase a Topic Tour. No. The Topic Tours are not refundable if you should have a meeting come up, prefer to see the conference or just forget. However, please stop by the Topic Tours counter in the South Entrance and we will try to move your tour to another tour time. We are no longer using the system that allowed you to indicate my interest. New to the Topic Tours Programme, you have to register for MWC19. Once complete, you will be able to go to My Registration, click on Topic Tours and register for those you want to attend. You will be able to pay for your purchase to guarantee your spot. The fee is €75. You can attend as many tours as you would like. Each tour has an additional fee of €75. Yes. You can join a tour onsite at the South Entrance. Each tour is an additional fee of €75. Please note, tours fill up fast. If you are unable to register, please stop by 10 minute before the tour. If people have not checked in, we are happy to help you join the tour. Please email GSMA at [email protected] up to two weeks before the event (by Friday 8th Feb 2019) with any questions or to request any of the services available below. Healthcare Services– advice regarding interim medical care, nursing service, personal assistance service, pharmacy, chiropody and physiotherapy. Orthopedic Services– Assistance with the hire and repair of orthopedic items, for example, wheel chairs, special chairs, etc. Leisure Oriented Services– Assistance with transfers, adapted quality transport, personal shopping, selecting suitable quality restaurants and rental of electric mobility buggies. Meet & Greet Services– To be booked individually upon request.